June | 2011 | Stay out of trees! 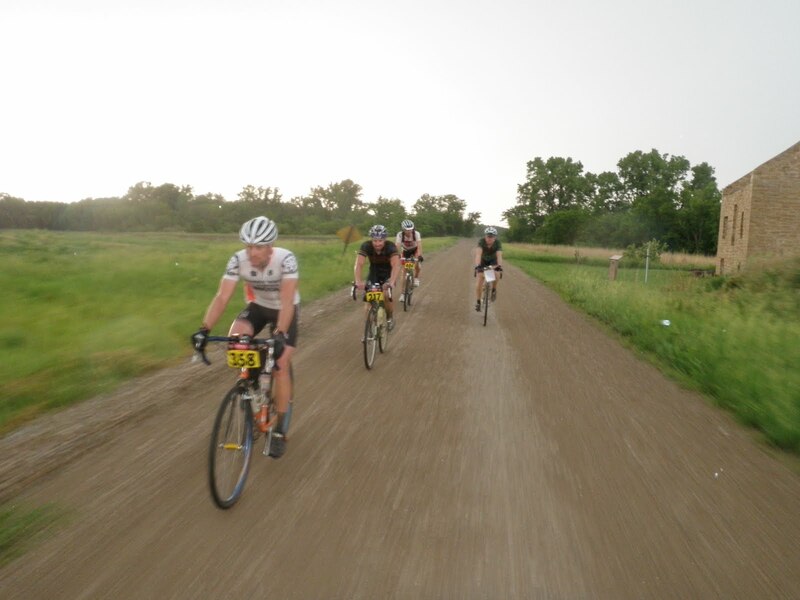 Last Saturday was the Dirty Kanza 200 and I was there representing for the 30¢ Squad. I rode the MASI SSCX. I ate a lot of King Size Salted Nut Rolls. This was my fourth ride at Kanza, and in order to get the most out of this year’s exciting story, I suggest you first brush up on your history with a read of my first, second, and third DK ride reports. Refreshed? Let’s go! The bike is set up pretty close to my old reliable LeMond Poprad for fit, but I went with the new svelte saddle it came with rather than my usual Selle Italia. I also tried new tires and went with the 700×35 Schwalbe Marathon Extreme instead of my usual 700×32 Ritchey Speedmax. Gear was 39 x 17. The drive down was all about pre hydration, the forecast was plenty of sunshine and highs in the 90’s. We arrived, checked in, and had another awesome pre race meal and beer(s) at Casa Ramos. 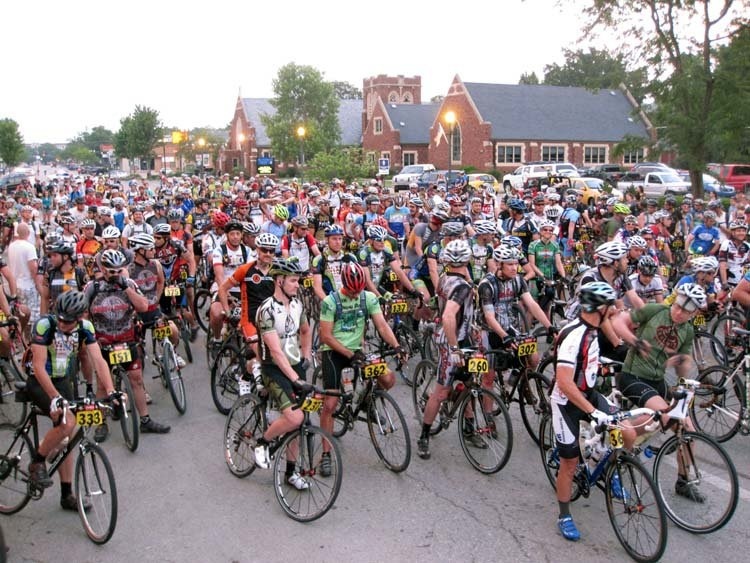 The Dirty Kanza starts at 6 am, so you have to get up early. We got up at 5 and were out the door at quarter til 6. A 3 mile ride to the start saw us show up at 3 minutes until go time, at least that is what the police officer told us. No problem, backed it in for the front row, fiddled with this and that and off we went. I was in it to win it, so I made an effort to stay at the front. We rolled out of town and hit the gravel which makes this event what it is and I was pretty comfy holding wheels in the frontish area of the field. I drifted back, I drifted up, a few times the field split at a corner or just when a tandem decided to push the pace a bit, but it kept coming together again. I wandered around and said howdy to some folks I knew from previous Kanzas. 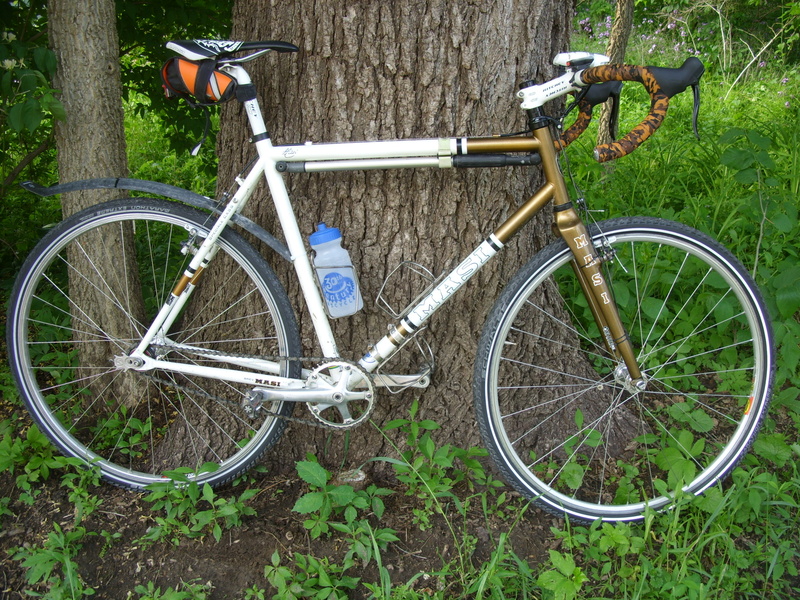 One thing that occurred to me, not many Surlys around the front of the gravel grinding scene anymore, but plenty of the custom, the carbon, and the ti. Oh my! Nearing the first check I was surprised that I had drunk all of my on bike liquids. Holy crap, I said aloud, it is not even hot yet! But it was true, I had put down 2 liters of Nuun and a 22 oz bottle of water besides. It was not even 10 in the morning! I made it into the first check feeling fine, and very happy with the way things were going. Support man Jeremi was there nursing his hangover and we had a quick chat as I loaded up my fresh bottles and grabbed another King Size Salted Nut Roll. I was a bit worried about on board liquids as the heat continued to build so I grabbed a couple of Gatorades at the C store to drink one and pocket the other. Back on the road for 44 more miles. This section started off with a fair bit of tailwind so I had to just settle down and ride, let the wind push me, and keep my hydration and eating going. I did not ride with many people on this section as most of the people around me were geared so they just rolled by while I was limited by my gear. I enjoyed the scenery and ate a Pro Bar. At mile 78ish there was a confusing part on the map, 2 unmarked turns in a row, and a big group of riders already standing there trying to figure it out. Confusion reigned, some folks rode off in a couple of different directions to see where the roads went. I held tight and drank some Gatorade, not wanting to ride any further than I had to. There was a consesus on which road to take and a group took off, but I was still not convinced so I kept waiting with some other folks. We had quite a group going, looking at the maps, compasses were out, and I was fretting that I had been stopped for at least 10 minutes at this point, when Matt Brown of Emporia rolled up and said we were going the right way. So off I went, back in traffic and a bit grumpy about it, but what can you do. Looking at the map after the event I know I could have just looked at the map closer, it was right all along. This road was awesome, I remembered it from 2 previous Kanzas, and it is totally rocky and remote with a few water crossings. I had been caught by 2 singlespeed riders at the navigation stop and rode with one for a while but we seperated on a climb. Shortly after I thought mine eyes were playing tricks on me when a recumbent passed me, but sure enough this phantom was real! John from Florida, part owner of the Bacchetta company, and here he was riding the DK200 on a recumbent. I was impressed! Our paces had a real tough time matching, so I wished him a good ride and we rolled apart. Just before the check I was caught by another singlespeeder from Chicago. We rolled a short bit together, but I had to stop to pee so I let him go. I kept my pace steady all the way into the checkpoint, and was happy to see that I was almost out of liquids again, I was drinking plenty – or at least as much as I could comfortably carry. I took a 30+ min break here. Called Cody to let her know how it was going. Sat in the shade. Ate food. Rubbed ice all over myself. Drank Gatorade. Reloaded my bottles. Had potato chips. Grabbed another King Size Salted Nut Roll. Talked with Jeremi and a guy from Eskridge. I rolled out alone at 1:30 facing a 60 mile stretch with no services, the heat of the day, and the feeling of the 100 miles already in the legs. There was a lot of tailwind here, so that was something. I was still feeling pretty good, but sometimes my stomach would go a bit funny. It became a game, wait for my stomach to settle, take a bite of King Size Salted Nut Roll, and then wash it down with Nuun. Kept all my systems going, except for my rear tire. Descending a hill at about mile 120 it blew. I was pretty bummed, hoping that the Marathon Extreme would last the day, but no. Major bonus that I rolled right into the shade, and the puncture was super easy to find. Dennis got up and moving and caught me soon enough. We had a chat about the heat and rode pretty slow for a tailwind section, but glad to be staying in motion. I was still feeling okay at this point, but was beginning to worry that there were still about 30 miles to go to the next check, and the heat was definitely working on me. How long could I last? A quick look south changed everything, there were huge clouds, they were dark, and they were about to block out the sun! It happened soon enough, the temp dropped in an instant and I was back to rolling full steam ahead. I could see a couple of riders ahead, but chasing on a single in a tailwind is futile, so I just kept chugging along. 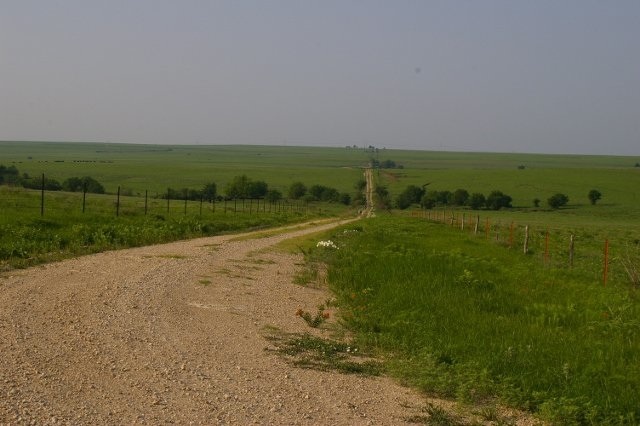 There was a beautiful B road here, miles of grass covered dirt road, it was really smooth except for some big rock sections, and I was having a blast. Came to a water crossing with a sharp rise after it and I had to hit it hard to get over it on the gear, still riding everything! The two riders up ahead were really close now, and then there they were, standing at the top of a hill. Corey again with another Nebraska rider named Dale. We rolled along and laughed about the clouds coming in, wondering if maybe the wind could possibly switch again and push us back to Emporia from the last check. It spit some rain on us, and Corey stayed on the gas and left Dale and I behind, we chatted some more and then he jumped up to Corey. Riding into town the wind started to whip, the thunder started to crash, and I was happy to get to the check before it let loose. Got the last map and found Jeremi at the car. I was going to do a smash and grab here, take 2 bottles and some food and roll, but 2 things happened. A squeeze of my tires showed the rear was super soft, and the storm landed. So I ran for the shelter of an overhang, and got to change my second flat in relative safety and comfort while the rain lashed down. Even had a floor pump! The storm blew itself out pretty quickly, I hit a C store for a bit more food while it finished up, and then I was rolling out. Saw the Nebraska guys, Corey and Dale and James were just saddling up as well so we rolled out together, 43 miles to go! The route was a rail trail for a few miles out of town so we rolled pretty quick on the flat grade. It was still raining, but not storming, and the temps were way down now, so it felt really good, I felt really good, too, and even the legs felt really good. I was not sure if I could hang with the group or not on the single, but was hopeful I could catch any singlespeeders remaining out in front of me. I had an idea there was just one, but it is really hard to keep track of who is where going through the checkpoints, so I actually had no clue what was going on except that I was 43 miles from being done. So we rolled, and the wet roads were really soft in some places, mud and rocks flying all over the place. My shoes were getting filled with pebbles which I fantasized were massaging my feet? The rain petered out, and the skies looked clear ahead all the way to Emporia. Our little group was chugging right along, slip slidding through some sections but morale was high. Mileage eludes me, but we came around a bend and there was a group stopped. Joe Fox and Tim Ek, I don’t remember if anyone else was there, but the mud and rocks had claimed the derailler of Joe’s nice bike and they were trying to single it. We stopped, they worked, the other geared folk started to clean their drivetrains, I waited a couple of minutes, asked if they were all good and then rolled on, solo again. I bet I rode 150 miles solo this year? Back on the road and the single was doing awesome in the constantly changing conditions. Shortly I rode through another low and muddy part, saw another geared rider walking with his bike on his shoulder to get through, and then on the climb out I rode past another singlespeeder walking the climb. I kept at it, the legs were feeling fresh and I was not just riding, I was putting power to the pedals, which is a great feeling after riding 170 miles. The route was going south, and I saw a lake on the map to the west of Americus (last town we would pass through) and I just knew it was the one we had ridden around on previous Kanzas, and there was a monster climb there. Looking ahead it was easy to know it was true, a big ridge loomed. We would see two big climbs to cross it. The first had me wondering if I could ride it, the gravel was still soft from the rain, but I had no problem. I could see another rider ahead, so that kept me motivated. I ground up the climb by the lake and was happy to see that I was riding it faster than when I had done it geared! Over the top I could still see the rider out ahead but he had a pretty good gap on me. The route swerved east and we even went back north a bit to take us through Americus. I caught the rider ahead at some point, and just after we turned onto a B road. It was a 2 track with tall grass, and a short squat powerful animal exploded out of the grass and took off down the road in front of me, I have never seen a Badger before but I knew immediately this was a Badger! Super cool, he was running for all he was worth, and I did not want him to decide that fight was better than flight so I hung back and yelled at it a few times to get it to clear the road. It did, but it dropped its dinner (big snake) to do it. I hope it came back for it, sorry to startle you Badger, but you startled me, too! The guy I had just caught thought maybe it was a gopher but I know me a Badger when I see one for the first time! So on we went, I left the other rider behind, the road into Americus was SUPER bumpy and I whimpred aloud, “oh come on already”, as there were still miles to go and my sitting parts were feeling pretty done with the whole bike seat thing. I got chased by a dog, not a pretty sprint I am sure. Had to remember to eat, 43 miles is still a long ways, so I cracked another King Size Salted Nut Roll and had a bite or two. Drank some more Nuun. Getting close to Emporia, and close to sunset, and I could not see any riders ahead or behind. I kept the pace as high as I could, and did not have to turn the lights on until the edge of town when we popped out on pavement. I rode into town, took a wrong turn (whoops) and rode across a big parking lot before realizing that last year’s DK markers were still on the pavement… Back on track, back on ESU campus, back on Commercial Street, and back across the finish line! There was a huge crowd. Lights! Cowbells! Cheers! It was awesome to be done, Jim Cummins came over for the handshake and congratulations, and told me 11th overall and 2nd singlespeed. We talked over the day, the flats and the heats and the storms, I thanked him and congratulated him on another amazing Kanza adventure, and then he had to go welcome in the next finisher. So I never did catch that last singlespeeder, but I am super happy with my ride. I did not cramp all day, I rode the entire course, I got a pint glass and a bag of Swiftwick stuff. Plus I had a good time. What more could I ask for? Big thanks to the promoters and organizers, the city of Emporia, the sponsors, and all the other riders for being part of such a great event. I hung out for a while, talked with other riders, cheered in other finishers, ate pizza, called Cody and my folks to let them know I was done. The support crew was still back at the 3rd check waiting for a really muddy tandem so I did not have my clothes to change into and did the podium in the 30¢ Squad kit. I really needed to get out of the shorts so I loaded up and rode the 3 miles back to the hotel for a shower – out of the saddle the whole way!